This is abdominal fluid from an 8-year-old male neutered, medium sized, mixed breed dog. The dog presented with vague gastrointestinal (GI) signs of vomiting and inappetence. Imaging studies showed the presence of free abdominal fluid. 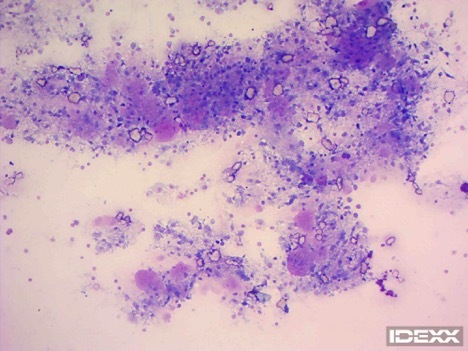 Approximately 5 ml of fluid was collected and submitted for cytologic exam. The sediment slide was stained with Wright’s stain(figures 1 – 5) and was directed to a clinical pathologist for review. What is your interpretation? Figure 1. Abdominal fluid cytology. 200x. Figure 2. 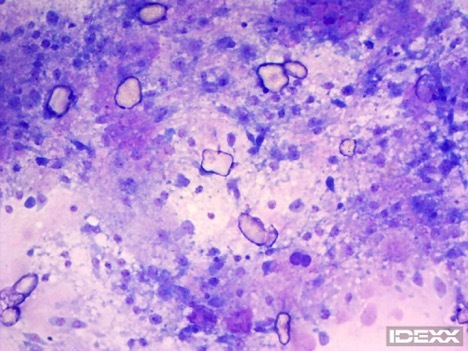 Abdominal fluid cytology viewed. 100x. Figure 3. 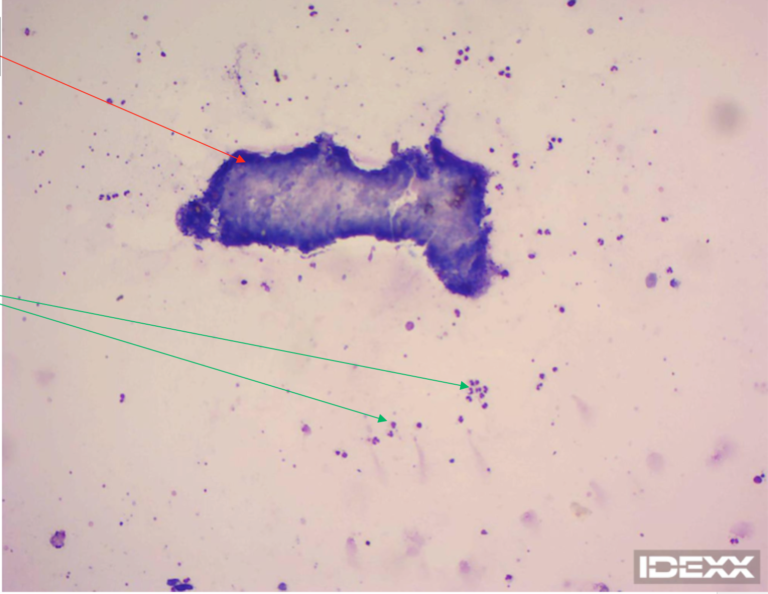 Abdominal fluid cytology. 500x. Figure 4. Abdominal fluid cytology. 1000x. Figure 5. 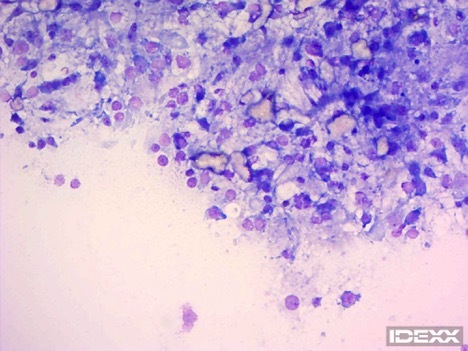 Abdominal fluid cytology. 1000x. 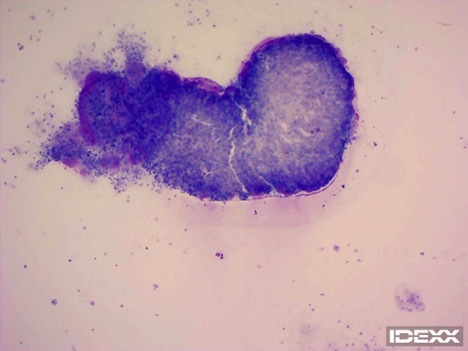 Cytology:The fluid had an increased nucleated count of 15,000 cells/microliter with approximately 85% nondegenerate neutrophils and the remaining 15% of cells were large mononuclear cells and lymphocytes. Several atypical structures consistent with cestode thyridia are noted (figure 6-7). These structures often contain clear to yellow refractive structures measuring approximately 20-30 microns. The shapes are variable ranging from oval to angular. These are calcareous corpuscles. Mesocestodes are a specific family of tape worm that exist in North America, Asia and Europe. It is not a very commonly seen tape worm (cestodes of the Taeniidae family are most common), especially in urban areas, but is among the tapeworms that can infect dogs and cats in the United States. Although an uncommon manifestation, it can sometimes cause a unique pathology beyond GI parasitism. This tapeworm has uniquely two intermediate hosts important for its development. Dogs are the definitive hosts with maturation of larva to the adult worm occurring in the GI tract. The first intermediate host is an arthropod. The arthropod ingests the eggs from the environment and maturation from the egg to the cysticerus stage occurs in the GI tract. The second intermediate host is a lizard or rodent that ingests the arthropod. At this time, the cysticercus matures to the tetrathyridial stage and migrates throughout the peritoneum and muscle of this host. The lizard or rodent is then eaten by a dog and the tetrathyridia mature to adult tapeworm in the GI tract. Ingestion of an infected arthropod (the second intermediate host is skipped and now the dog acts as this host). The dog ingests the tetrathyridia but instead of staying in the GI tract, it migrates out into the peritoneal cavity. This condition can be asymptomatic and recognized incidentally during spay or neuter, or symptomatic. The presenting signs are predominantly ascites/abdominal distention and GI signs. Figure 6. Mesocestode thyridia. 200x. Figure 7. Larval cestode (red arrows) and neutrophils (green arrows.). 100x. Figure 8. Calcareous corpuscles. 100x. Figure 9. Calcareous corpuscles (red arrows). 100x. Figure 10. Remnant cells of the cestode larvae (red arrows). 1000x. A recent survival study (see reference 1) has shown that the severity of clinical signs upon presentation and aggressiveness of treatment are the most important indicators of prognosis. In a recent study, 72% of dogs were alive at six months post diagnosis and 60% were alive in one year. Recommended treatment includes administration of Fenbendazole (both oral administration and intraperitoneal lavage have been described). Intraperitoneal lavage is also recommended. The patient in this case was given Fenbendazole and did well for a few days, but then had episodes of lethargy and inappetence progressively manifest while at home. A CBC at that time was normal but when repeated in two weeks, it revealed moderate thrombocytopenia and mild neutropenia and it was determined that he had an idiosyncratic drug reaction to the medication. Over the following weeks, he continued to show lethargy and inappetence and developed a severe pancytopenia. At that time, the owner elected euthanasia. Survival analysis of dogs diagnosed with canine peritoneal larval cestodiasis: Boyce A., et. al. Veterinary Parasitology 180 (2011) 256-261. 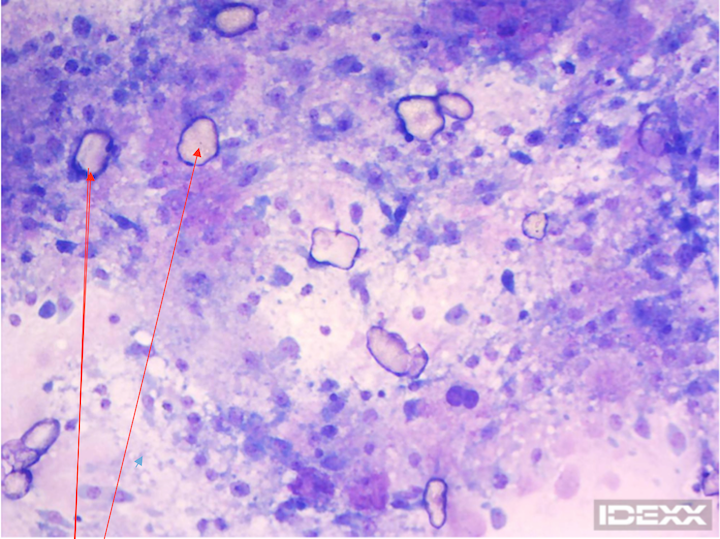 Cytologic and molecular diagnosis of peritoneal cestodiasis in a dog; Piseddu E., et. al., Veterinary Clinical Pathology 32(2):50-60 February 2003.